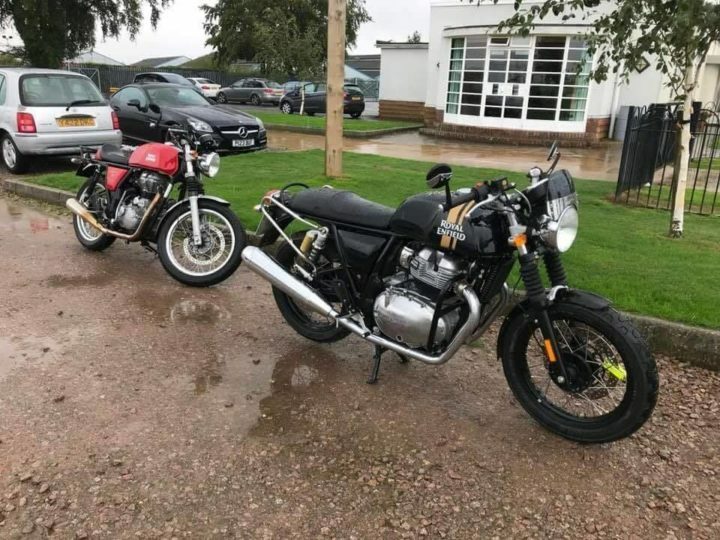 Royal Enfield Continental GT 650 has been spied without any camouflage. The Twins are scheduled to launch globally next week in the USA. They will come to India in November-December period. The Royal Enfield Continental GT 650 and Interceptor 650 are all set to launch globally next week. The Twins are much awaited as the Continental GT 650 is a pure cafe racer replacing the Continental GT 535 and the Interceptor is a Street bike. Ahead of its launch next week, the GT 650 has been spotted undisguised in the States. Also, it is spotted equipped with many accessories. So let’s start with the accessories that were spotted on the Continental GT. The Continental GT 650 gets black-bar end mirrors, a touch of chrome on the mirrors, a small flyscreen, a crash guard and chrome detailed saddlebag stays. Do not worry, there will be more features. These are some features that the Royal Enfield Continental GT 650 will get. The actual list will have more features. Also, just the Continental GT 650 has been spotted here. We believe that a similar set of accessories will be provided on the Interceptor 650. Now moving on towards the features and specifications, we recently got our hands on the user guide manual of both the bikes. The Royal Enfield Continental GT 650 and the Interceptor 650 get a 648cc parallel twin-cylinder engine. This engine produces around 47 BHP and 52 Newton meters. The engine is paired to a 6-speed gearbox with wet multi-plate clutch, assist and slipper clutch transmission. We also have an idea of the fuel tank, mileage, and top speed. The GT 650 gets a fuel tank capacity of 12.5 Litres and 1.5 Litres as reserve fuel capacity. The Interceptor gets a 13.7-liter tank and a 0.75-liter reserve tank. The mileage estimated on both the bikes is around 20 kmpl. The mileage might seem short for you, but its decent for a 600cc bike. The top-speed recorded on this bike is around 165 km/hr. As it is Royal Enfield and plus a Retro bike, we do not expect any major features. It comes with features such as a sculpted Tank, Clip-on handlebars, Front and Rear Disc Brakes with dual-channel ABS, Halogen headlamps, Twin Pod Speedometer, Single Person Seat (Optional on Continental GT 650) and Upswept Twin Exhaust system. Moreover, did you know that the Interceptor is a bigger motorcycle than the Royal Enfield Continental GT 650? Yes, there is nearly a gap of 114 mm between both the bikes as Interceptor is taller and wider than the GT by 24 mm. Also, the Interceptor weighs 4 kgs more than the Continental GT 650. What price expectations do you have for the 650 Twins? We expect the prices to start at around Rs 3 Lakhs for the Interceptor 650. The Royal Enfield Continental GT 650 might be priced a little above than the Interceptor 650. The Interceptor is expected to go for Rs 3.5 Lakhs.